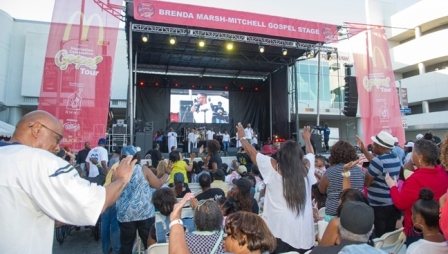 The McDonald’s 2018 In­spiration Celebration Gospel Tour (ICGT) will once again be culminating at the annual Taste of Soul festival, bringing renowned local and national talent to perform on the Brenda Marsh-Mitchell Gospel Stage. Now in its 13th year, the event has become a family-favorite tradition for the entire community and a true Los Angeles staple. 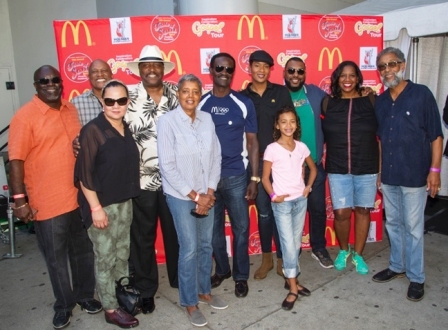 The McDonald’s gospel stage is championed by the local chapter of the Black McDonald’s Operator Association (BMOA) and is coordinated in collaboration with Los Angeles Pastor, Kelvin Sauls. Pastor Sauls has been a long time advocate and contributor to the McDonald’s gospel stage, helping identify and secure local talent that will inspire attendees with their messages of faith. Like the many BMOA members who are actively involved with the event, he sees gospel music as part of the fabric of the black community. In addition to giving back to the community in the form of this free concert series, BMOA members strive to make a positive impact in a variety of ways. As independent business owners, they provide jobs to thousands of local residents, including many that live within walking distance of their establishments. They also express their commitment as community leaders by hosting fundraisers for local schools, offering grants to local charities and funding scholarships for local youths. Locally, BMOA also collectively and individually supports Ronald McDonald House Charities® of Southern California‎ (RMHCSC). In keeping with McDonald’s longtime tradition as founding mission partners of the charity, this year’s tour will again support the Southern California chapter and its six Ronald McDonald Houses located throughout the region. Every penny raised stays right here in the local community, directly supporting families who need a home away from home as their ill child undergoes life-saving medical treatment. Since 2012, the tour has helped raise more than $510,500 for local RMHC Chapters, with the 2017 tour alone generating over $240,000 in funds. Another element of the tour is the addition of a scholarship opportunity. This year, McDonald’s will award one HBCU college student with a $10,000 Thurgood Marshall College Fund Scholarship during an ICGT tour stop. The winning student will be able to use the funds to cover the costs of tuition and fees, on-campus room and board or required textbooks. This is one of five scholarships McDonald’s is sponsoring throughout the year. 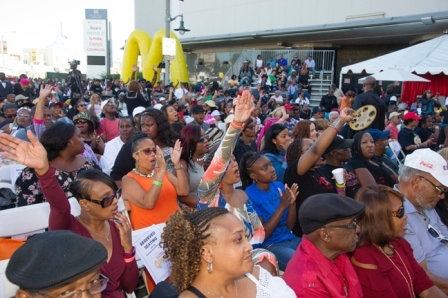 McDonald’s Inspiration Celebration Gospel Tour is an extension of the brand’s 365Black platform, an initiative that celebrates the pride, heritage, and achievements of African­-Americans year-round. With an impressive lineup that includes popular local choirs and performers alongside national gospel stars, the tour will once again give families and gospel music lovers an uplifting and unforgettable experience.